Life is slowing down in Bozeman, a small city in southern Montana near a major railroad. More shipments of Bakken Shale oil and local coal are passing through, and it’s taking drivers more time to cross the tracks and get around town. Fire trucks, ambulances and police cars have to wait while carload after carload chugs along. “It takes longer for those public safety services to get to us,” says Beth Kaeding, a Bozeman resident and conservationist. The U.S. shale boom and a rise in coal exports is having a similar effect nationwide, according to a federal transportation report released late last week. If freight flows continue to rise as expected, it could “exacerbate congestion issues” and raise new safety concerns in communities near train tracks, the U.S. Government Accountability Office (GAO), an independent agency, said in its investigation. The report cited a recent incident in Baker, Montana -- about a five-hour drive from Bozeman -- where a fire destroyed a house that fire crews couldn't reach quickly because train traffic blocked the railroad crossings. Such omissions could undermine the usefulness of the department’s National Freight Strategic Plan, the GAO said in its Sept. 26 report. The agency conducted the study at the request of Max Baucus, a former Democratic senator from Montana and the U.S. ambassador to China. Oil companies are increasingly turning to railroads because of a lack of existing pipeline infrastructure that could move their crude and refined products to market. About 415,000 railcar-loads of crude oil moved through the United States last year, compared to just 9,500 loads in 2008, according to federal figures. In North Dakota alone, as much as 70 percent of the more than 1 million barrels of crude oil produced in the Bakken Shale was shipped by rail in the first half of 2014, the North Dakota Pipeline Authority has estimated. U.S. coal exports are also picking up as domestic demand for coal continues to fall, the GAO noted. Mining companies are shipping more of the fossil fuel to energy-hungry countries like China via ports on the Pacific Coast. Canada already has coal export terminals, and coal companies are proposing two terminals in Washington State and one in Oregon. In the Pacific Northwest, the congestion is making it harder for agricultural producers and other suppliers to ship their goods via rail. 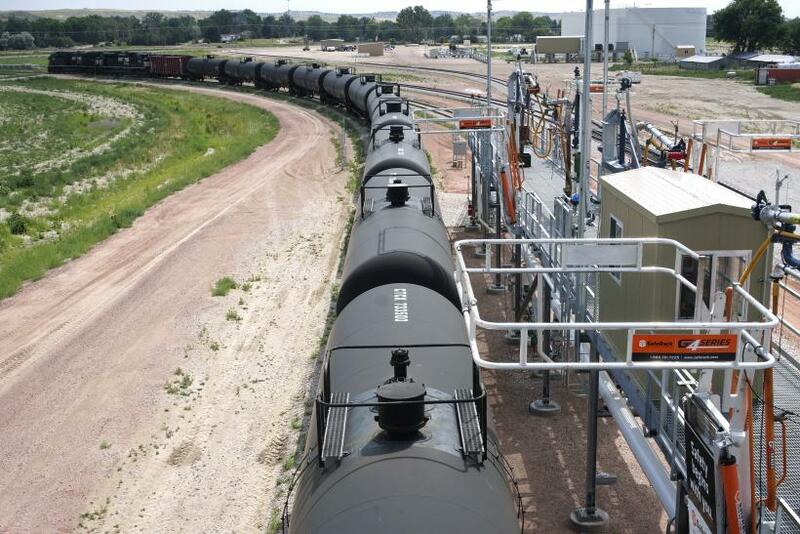 Last month, the operator of a refrigerated rail service, Cold Train, said it was suspending service at a Washington port due to long delays on rail lines and a near-doubling of transit times, in part because of Bakken crude shipments. The service would have guaranteed to deliver Washington’s apples, cherries and potatoes to Midwest markets within three days, according to the company. A spokesperson for BNSF Railway, which operates one of the largest freight networks in North America, referred a request for comment to the Association of American Railroads. The industry group’s spokesperson was not available by deadline. The GAO report found that local communities are largely on their own if they want to increase the number of rail crossings, improve traffic signals or take other measures to alleviate the train traffic and reduce the risks of accidents and derailments. Funding is limited in state and local agencies, and private railroad companies aren’t required to pitch in. The agency studied two-dozen congestion-related improvement projects in communities around the country. It found that private funding contributed to just 1 percent of the $3.2 billion in total expenses. “Railroad companies’ contributions to congestion mitigation projects generally amounted to less than 5 percent of the project’s total cost and were based on the project’s potential operational benefits to the railroad,” according to the report. The report “clearly shows that there are a lack of resources and ways for communities to get help with the infrastructure needs they have now, and are going to have even more of,” said Kaeding, who is also a member and former chairwoman of the Northern Plains Resource Council, an environmental organization. “We need to have a better overall view of what’s going on with our rail infrastructure, and these companies need to help in a better way to pay for what has to be done and ease the burden off the taxpayers,” she added.